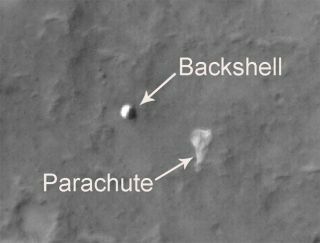 The parachute from Mars Exploration Rover Spirit is lying on the Martian surface. The cone-shaped back shell, which helped protect Spirit's lander during its trip to Mars, appears relatively undamaged. Aftercircling the red planet for more than eight months, NASA's MarsReconnaissance Orbiter has taken imagesof three spacecraft that the agency had previously sent to the Martian surface. The orbiter provided high-resolution images of the Spirit rover [image]that has been active on the surface since 2004 and of the two Vikinglanders that reached Mars some 30 years ago. Aerialviews of the surrounding terrain and detailed features are helping scientistsget a new perspective on some familiar sights [image]. "Weknow these sites well at ground level through the eyes of the cameras on Spiritand the Viking landers," said the project'sprincipal investigator Alfred McEwen of the University of Arizona. "Applying that knowledge as we view the new orbital images will help usinterpret what we see in orbital images from other parts of Mars never seenfrom ground level." In additionto helping scientists plan for future missions and current surface activities,the images have also left them in awe. The view ofViking Lander 1 [image]shows the spacecraft's back shell 850 feet from the probe and its heat shieldsome 3,400 feet away from the probe. The spacecraft landed on the planet's surfaceon July 1976. "Thebiggest surprise is that you can still see what appears to be the parachuteafter 30 years," said Tim Parker of NASA's Jet Propulsion Laboratory. Images ofthe Viking Lander 2 site are especially interesting to NASA scientists as theyare considering it a candidate landing site for NASA's PhoenixMars Lander mission, scheduled to launch next summer.